And all through the shop, not a creature was stirring least of all the mop. The gear was hung right were I left it in hopes that someone else would clean it up, or I finally figured out how to clone myself. So, the Holiday season is right around the corner and you don’t know what to get your trusty steed for Christmas? My bike passed on a list of a few things that would fit just about any budget. First off, having had the opportunity to ride a selection of BMW’s, I am now a huge fan of heated grips. You can use them to extend your comfortable riding season substantially, and you will find yourself turning them on most evenings as well. Complete replacement grips retail for about $100, or a new style has the element on a thin sheath that goes on under your existing grips. They come with a high / low switch and all wiring instructions. I know a couple riders that swear by heated vests as well to help keep your body core warm. Either of these warm solutions would make a great gift. My bike also reminded me that front and rear stands are an invaluable gift for anyone that does their own tinkering. From adjusting and lubricating your chain, to tire changes, brake pad and brake rotor inspection, to cleaning and storage, economical front and rear stands are great value and will last you a lifetime. I use exclusively Hindle stands on my bikes, but Riders Choice in the Toronto area stock a nice adjustable Italian set as well. They even have a unit that picks up on the bottom triple clamp via the steering stem to aid in fork service or removal as well. Most motorcycles would love you if they found a new exhaust pipe under the tree. The aftermarket pipe builders have really had their work cut out lately as the manufacturers are leaving less and less on the table. In years past a reasonable expectation of 8-10 horsepower was the norm, with a secondary benefit of dropping 15 or more lbs. Now, the factories are using aluminum or Titanium exhaust cans mounted on Titanium front sections to get maximum horsepower and minimum weight in stock trim. This however is most typical on the front line full sports models from each manufacturer, as the rest of the bulk of the product lines still sport more conventional exhaust systems that will benefit greatly from a performance aftermarket system. Switching to a Hindle or an Akrapovic on a full sport bike now a days will gain you more like 3-5 hp (before optimizing) and may shed only 4-10 lbs. However, this is still very respectable considering the tremendous quality of the OEM product that has been coming out. 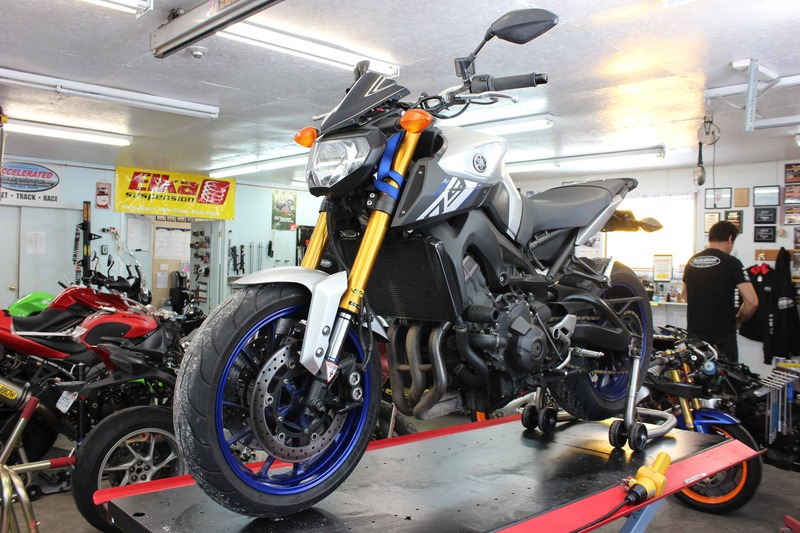 You can dress up your bike, gain a nice subtle sound improvement and enjoy the performance gains from adding an aftermarket exhaust for around $1200 to $2500. Or, for a look and sound improvement that wont disturb the stock headers or require you to jettison your stock Exhaust valve system, Slip on mufflers can be had for somewhere between $600 and $1200 depending on the model. A special treat for the Fuel Injected bikes out there would defiantly be the addition of an ‘add on’ control box to the ECU. By far the most popular is the Dyno-Jet Power Commander units. To simplify their function, these units connect inline to the stock wiring harness and modify the length of the injector pulse, therefore changing the mixture. You can make large-scale corrections by pushing buttons on the box, or the techno tinkerer can create custom maps on their own computer, or even down load maps for their specific modifications from the Internet! Or for the ultimate in perfection, once you have done all your modifications (pipe, air filter etc. 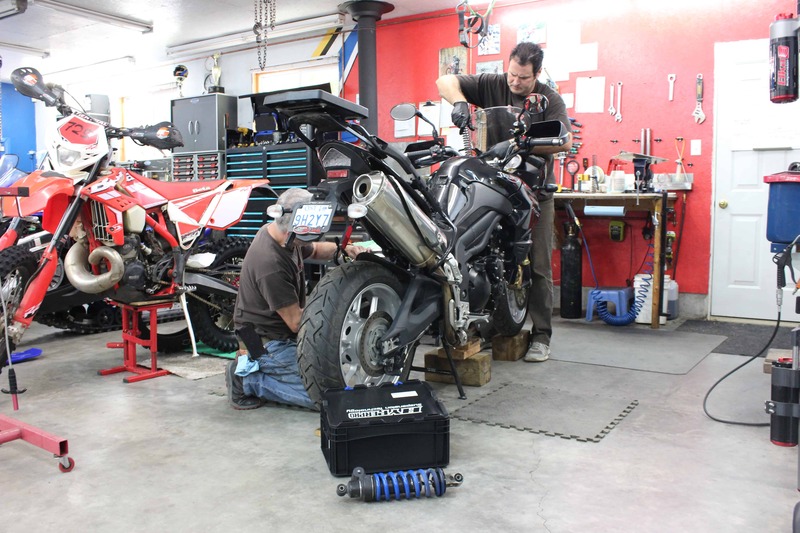 ), and poured in your favourite fuel, you can head off to a reputable shop with a newer Dyno-Jet Dyno and utilize their Tuning Link software to custom make a map for your exact motorcycle. You can even request special conditions of the map such as maximum economy for cruising (0-10% throttle) but maximum power at larger throttle openings. If you live within driving distance of Ontario, call Rob Egan from Brooklin Cycle, as he would love to help you out with the sale and custom mapping of your Power Commander. 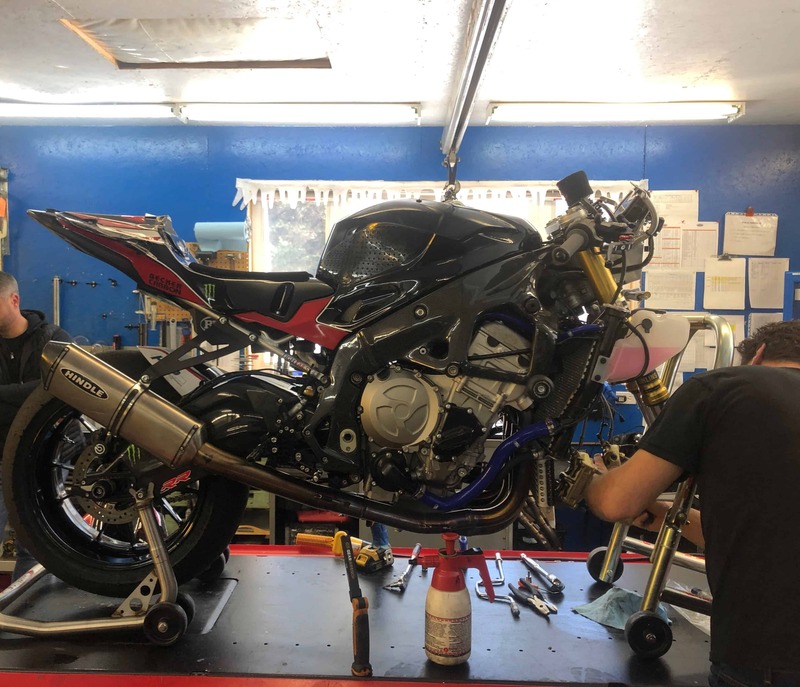 Yoshimura and Factory Pro also offer solutions to improving your stock fuel injection as well, so look into those too! The other things on my bikes wish list are a 520-conversion kit (chain and sprockets), to shed driveline weight and add gearing adjustability. Most litre bikes use a heavier chain and big steel sprockets. Substantial acceleration can be freed up by switching to the aftermarket standard 520 size, and you may wish to make a gearing change while you are at it as well. The last thing my bike requested was aftermarket brake lines. He says that his rubber ones are a few years old and spongy and he can’t feel the pads when I squeeze the brake lever. Man, I thought kids were expensive to buy for! 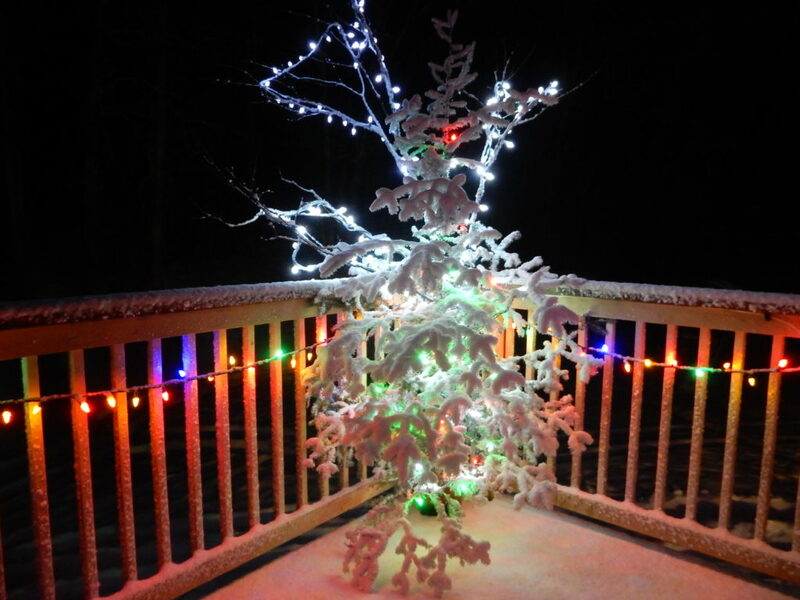 Happy Holidays from all of us at Inside Motorcycles, see you next year.